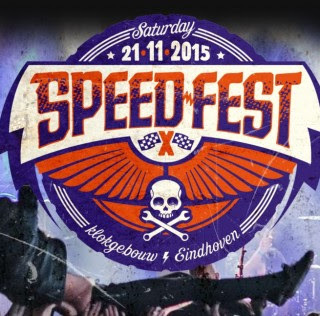 For the tenth time Eindhoven band Peter Pan Speedrock are organizing their Speedfest festival, that focuses on everything heavy. Things took an ugly turn last week with the Paris terrorist attacks that cast a dark shadow on the music scene and took away one of their headlining bands Eagles of Death Metal. The schedule was shuffled a bit to deal with the empty spot in the line-up and security was increased. It causes a bit of a delay when entering the festival which was announced by the organization days ahead of the festival, but the seemingly long line moves fast. We arrived a little later than planned anyway and unfortunately therefore have to miss some of the early bands. We can still catch the last bit of Scorpion Child's show, a hardrock band from Austin, Texas who made the big step across the pond this year. Their retro style hardrock, on the heavy side of Led Zeppelin, is not a bad start of the day. Solid guitar riffs on heavy grooves support the howls of singer Aryn Jonathan Black. It definitely got us warmed up for what's more to come. A big skull, the logo of the band, is grinning at us from the back drop behind the Swedish Backyard Babies, but at the same time red LED lights are running around the amps on stage. This means it's time for some sleaze rock from this group that has been around since 1987. All these years pay off in a tight show that is a mix of hard rock and punk, but always with some tongue in cheek. Their sound reminds of Guns N' Roses a lot, but more importantly the band is playing very convincingly and with a lot of heart. They showcase all rock poses known to men and make use of small risers at the front of the stage to go through them. It results in a very entertaining show and positive vibes across the hall. I was disappointed with Nick Oliveri's latest album and wasn't even planning on going to his performance today. Fortunately my friends wanted to go, so I find myself at a surprisingly tight show with lots of stoner. The former Kyuss and Queens of the Stone Age bass player is going through his whole long music background and is playing a mix of stoner and metal. Of course the name "Mondo Generator" comes from the Kyuss era, but especially the stoner songs sound great, with heavy grooves, laid down by the three piece band, sounding very tight. Oliveri shows why he was so important for Kyuss and Queens of the Stone Age in the earlier days. Unfortunately it leaves little time for Giuda who are about to wrap up their show. The Italian band play retro style glam rock in the style of T. Rex and The Sweet and are doing a good job at it. Both band and crowd are all fired up and singer Tenda's voice is strong. Hopefully next time I will be able to watch them longer. Punk band The Dictators are regarded as the missing link between bands like MC5 and The Stooges and the later punk wave in the late seventies. They had a few line-up changes but still have some of the original members including front man Richard Manitoba, guitarist Ross Friedman. They went on a long hiatus halfway the seventies only to return beginning of the nineties. The band, solely relying on their old songs because of lack of new material, shows why they are still meaningful with an inspired performance that breaths their long history. Especially Manitoba, Friedman and bassist Dean Rispler, although grey and older, act like young dogs and show they still haven't lost their touch. One thing I like about this festival is the number of fresh hardrock bands like Crobot. The band from Pennsylvania has a typical retro hardrock sound with that heavy blues core. They went on tour with Motörhead a few months ago and by the sound of it will have won some new fans over. Singer Brandon Yeagley has an impressive voice and looks like a rabies dog now and then when he has his eyes spread wide open. It certainly rubs off on the crowd and it results in an energetic performance. By the time Danko Jones take the stage, this festival is running at full speed and power now and you can leave it up to Danko Jones to put some more oil on the fire, especially on a festival like this. It is clear Danko Jones himself is feeling like a kid in a candy store, with so many great rock bands around, something he tells the crowd halfway the show. It makes their show even more explosive where bass player John Calabrese is firing up the crowd in his usual fashion with a never fading smile on his face. All fired up it is time for Refused to keep this party going and it's exactly what they are doing. The Swedish band became something of a cult name during their hiatus that started end of the nineties. I was expecting to find more people at their show, but maybe I've just overestimated their popularity. It doesn't matter since the band is still full of fire and is playing an inspired show. Singer Dennis Lyxzén is all over the place and the wild punk songs sound sharp and convincing. Always a band to share their political opinion Lyxzén briefly addresses the Paris attacks at the end of the show, with a well meant short speech. Hopefully they are now here to stay for many years to come. After their show is over, there's a moment of silence out of respect for the victims of the terrorist attacks. This is the spot Eagles of Death Metal was supposed to play and it's the only time today the Klokgebouw is absolutely quiet and isn't shaking from the heavy rock grooves. It's a well chosen moment and everyone honours the silence. Organizers Peter Pan Speedrock are now playing themselves and moved up in the bill to fill up the empty spot. The large turn up for their performance, shows everyone is fine with this change in the line-up. Their no-nonsense straight on heavy rock, reminds of Motörhead sometimes with double bass grooves and blast beats. It's obvious it goes down well with the crowd, who shake their heads and down a few more beers. The festival is far from over after the show of the hosts and there are a few more bands still to come. We watch our last band of the day, The Vintage Caravan from Iceland. The band is playing classic style psychedelic rock inspired by the big bands from that era like Led Zeppelin, Rush and Cream. The band is doing a good job at it, playing heavy groovy jams with great sounding guitar solos. However sometimes the prog rock elements can make it a bit weary and unfortunately singer Óskar Logi Ágústsson's voice isn't really strong. Still it is a nice end to a heavy but satisfying day. Today showed that the terrorist attacks in Paris has left its marks in the music scene especially the rock scene. Personally I feel it affected me too, since music has always been my happy place. No matter how I feel, when I play a record, but especially when I go see a band play, I feel energized and happy again. The attacks in Paris violated that world and my happy place. But today Speedfest and all the wonderful people at the festival restored it in all its glory. It also showed that you can't rob us from our music, since it will always bounce back.